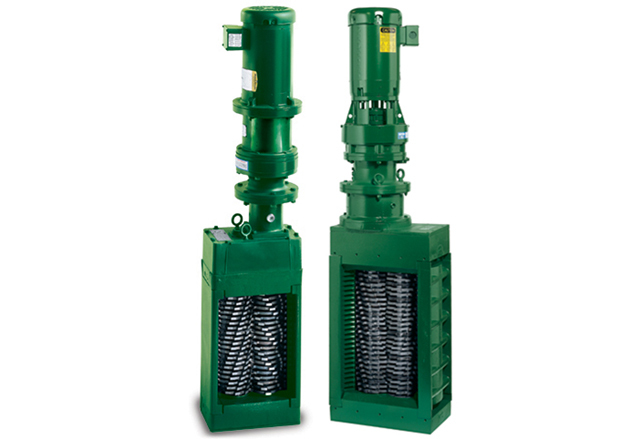 The 30K & 40K Open Channel Muffin Monster ® sewage grinders have been providing peace of mind to sewage collections and treatment plant operators for over 40 years. JWC Environmental has refined its design in that time to offer wastewater professionals the ultimate solution to cut down troublesome solids and rags that can clog pumps, valves and treatment equipment causing costly damage and excessive repairs. The 30K Muffin Monster sewage grinders are the workhorse of collections systems covering flows from 370 to 5620 gpm (84-1277 m3/hr). The 40K Muffin Monster sewage grinders are the even stronger version with robust 2 ½” (64 mm) hex shafts, larger cutters and a standard 10 HP (7.5 kW) drive motor. The 40K is for the highest solids loading environments like prisons and combined sewer pumps stations. 30K & 40K Open Channel Muffin Monsters are engineered to fit within wastewater channels or to be affixed onto wet well walls at pump station inlets. In wet well installations, stainless steel mounting frames are designed and fabricated for your unique installation needs. All Muffin Monster grinders have two rows of hardened steel cutters that rotate at slow speed and with incredibly high-torque to grind down large solids into small particles. 30K Muffin Monsters are also available with Wipes Ready® technologies which are specifically designed for shredding wipes and rags. The Wipes Ready cutters shred rags and disposable wipes into small pieces that will not weave back together and form long ropes so pumps are protected from damaging clogs and unplanned downtime. If you need your Muffin Monster fast, the 30K Open Channel Muffin Monsters are NOW available with the Monster Quick Ship. Click here to learn more about Monster Quick Ship. No matter what comes down your sewage lines, the Muffin Monster grinder can tear it to shreds, and let it pass harmlessly through your system! Protect your pumps today!